This makes us proud and happy. Five of our partner schools in Upi, Maguindanao scored very high marks in the March 2018 assessment of SGCs. They used to have low scores but in just three years, these schools and their respective SGCs have definitely stepped up. 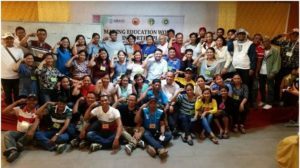 Kabugkabug Elementary School, Passi Primary School, Renti Elementary School, S. Midal Primary School, Tenonggol Elementary School-Annex are now empowered to champion education policies and are more proactive in initiating programs for the schools. Three of these schools share their stories. Kabugkabug Elementary School credits the good relationship of SGC officers with stakeholders and the community. SGC projects receive support from the barangay development fund and the secret ingredient is the SGC Chairmanship of the Barangay Captain and the membership of the School Principal in the Barangay Development Committee. To raise funds for projects, the SGC has partnered with the alumni association and the PTA, held a bingo bonanza, a foundation day celebration and a “King and Queen” contest. Some of their projects are concrete fence and installation of wash facilities in front of all classrooms. Tenonggol Elementary School’s transformation came with the appointment of a new principal. Principal Joven Molanggana along with the SGC president Sheila Marie Arino did a complete overhaul on the SGC. According to Principal Molanggana, SGC President Arino has a gift for fundraising. We can see this tenacity and drive at how in 2016, after the SGC Level 2 workshop, the SGC planned to construct a makeshift school building for third and fourth graders. Through hard work, the SGC was able to construct a makeshift classroom made of wood and bamboo. 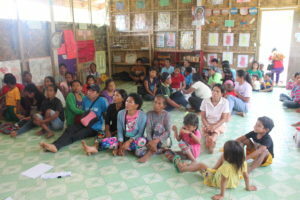 Many of the schools that Synergeia works with are in far-flung parts of the Philippines and S. Midal Elementary School is one of those, being in a DENR reservation site in the mountains of North Upi. The population is composed of Teduray, a major IP group in Southern Philippines. Florencio Midal, the barangay’s tribal chief, is the current adviser and major benefactor of the SGC. He donates wood from his vast farms and woodlands. The SGC is comprised of dedicated officers who always attend SGC meetings. Among the projects they have carried out, some jointly with the PTA, are the construction of 2 makeshift classrooms for kindergartens and third to sixth graders, construction of classrooms for first and second graders, a multi-purpose hall, and a school stage. We imagine the happiness and comfort of schoolchildren in North Upi who have classrooms, wash facilities and school stage for their programs. This is the true success story to tell.